The cranberry fruitworm (Acrobasis vaccinii Riley) is common throughout the eastern United States and Canada. It may be found on a variety of small fruits including cranberry, blueberry, and huckleberry. The adults are small, brownish gray moths with a 16-18 mm wingspan (5/8 to 3/4 inch); they are seldom seen because they are active only at night. Larvae are smooth, elongate caterpillars with three pairs of thoracic legs near the head and five pairs of fleshy prolegs along the abdomen. They are usually pale yellow-green in color, but may turn a light pink on the dorsal surface as they mature. Fully grown larvae reach about 15 mm in length (5/8 inch). Adult moths emerge and mate very early in the spring, about the time blueberry buds start to open. 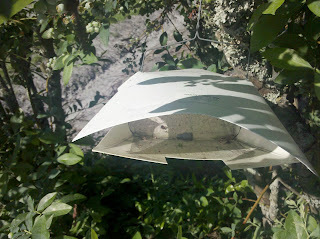 Fully grown larvae drop to the ground and spin silken chambers under blueberry plants. They pass the summer, fall, and most of the winter as larvae inside these hibernacula, then pupate in late January or February. There is usually only one generation per year, although a few individuals may continue to develop and produce a second generation on deerberry (Vaccinium stamineum L.) in July (Neunzig 1972). Females lay their eggs on green berries that are just beginning to develop; the oviposition site is usually located near the edge of the calyx cup. First instar larvae hatch in four to five days, burrow into the berry, and feed on the pulp. As larvae grow, they move from berry to berry within a cluster leaving behind a trail of frass (excrement) and silk. 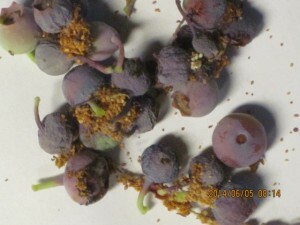 Damage due to cranberry fruit worm larvae. Note frass on outside of fruit. Photo via client. 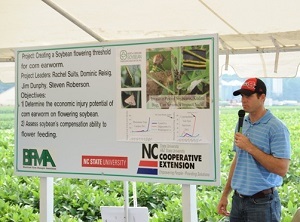 Adult moths of the cranberry fruitworm can monitored using pheromone baited traps. This technique will not provide adequate control by itself, but it helps determine if insecticide applications are necessary and optimize timing. Larval infestations can be detected by looking for the pin-sized entry hole near the stem of small, shrunken berries that have turned blue. The distinctive frass and webbing produced by this species does not usually appear until the larvae are several weeks old and begin moving between berries. Both egg and larval parasites have been associated with the cranberry fruitworm (Maxwell and Morgan 1951, Neunzig 1972). Phanerotoma franklini is the most common of these species, but it has never been found in densities high enough to provide effective control. See the North Carolina Agricultural Chemicals Manual for specific management information. Fulton, B. B. 1946. Dusting blueberries to control the cranberry fruitworm. J. Econ. Entomol. 39: 306-308. Neunzig, H. H. 1972. Taxonomy of Acrobasis larvae and pupae in eastern North America (Lepidoptera: Pyralidae). USDA Tech. Bull. 1457. 158 pp. Maxwell, C. W., and C. T. Morgan. 1951. Life history studies of the cranberry fruitworm, Mineola vaccinii (Riley), in New Brunswick. Ann. Rep. Entomol. Soc. Ontario. 82: 21-25. Tomlinson, W. E. 1962. The response of the cranberry fruitworm to black light. J. Econ. Entomol. 55: 573.